Deterioration of the dark adaptation function in patients with drusen. Some studies postulate that the presence of drusenoid deposits may prevent the proper transport of molecules between the photoreceptors and pigment epithelium of the retina. 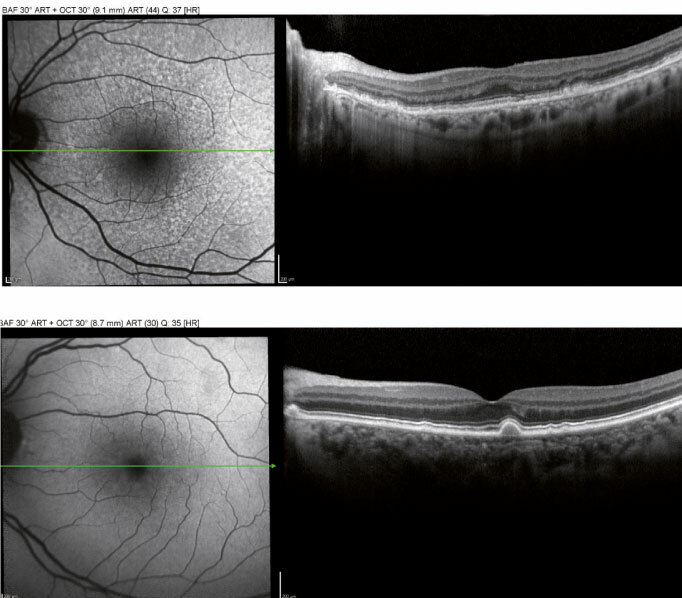 Several longitudinal studies have revealed that reticular drusen are strong predictors of the progression of both neovascular AMD and geographic atrophy. As a result, there is growing interest in understanding the role played by this type of drusen in the pathogenesis of AMD. The primary aim of this study is to compare the percentages of patients with soft or reticular drusen who suffer alterations in the dark adaptation function, with the patients of a healthy retina control group. In turn, this study aims to quantify the differences in dark adaptation time between subjects with soft drusen and those with reticular drusen. To do so, the rod intercept time will be established and compared for each subgroup. This variable will be measured by means of the AdapDx (Maculogix®) instrument. In studies conducted by Jackson et al. at the University of Alabama, dark adaptation time was quantified by comparing different ages and states of AMD. They found that this function worsened with age and as the pathology progressed. In our daily practice, we encounter patients with high visual acuities and virtually clean ocular fundus examinations that present severe symptoms, contrary to what might be expected. In this study, we attempt to quantify the functional impact of drusen on dark adaptation time and thereby explain the symptoms and draw up a set of guidelines.